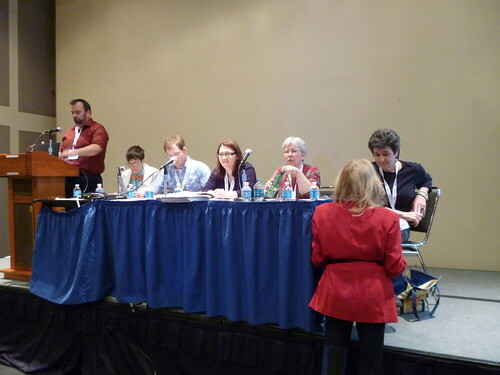 Panelist cover a spectrum of booksellers, writers and a librarian, but all share a deep love for graphic novels. This panel was moderated by John Hogan from Graphicnovelreporter.com. Prior to the panel beginning there was a 17 page power point slide handed out to room attendees. How accessible this medium is for people who want to learn something quickly, and not want to read about it. There is more hybrid graphic novels, with books being more of a mixture of text and words (prose). Adaptations means experiencing the presentation of words in an exciting matter. Some selections are not finished, but definitely impressed the panelists to choose it. The Best of Enemies by Jan Filiu and David B. This is not the first year that JLHLS has covered BEA, and for those past entries click this blog’s tag of BEA. Take a look at these links for my photos of BEA, one is from my camera, and another is from my cell phone. 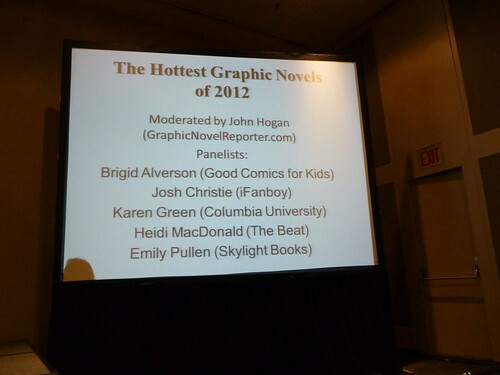 I’m glad to see Brigid Alverson on that panel. She’s always given J LHLS good coverage.